Swallows are some of the most elegant and graceful birds in the world, and their aerobatic flight can be amazing to watch. Unfortunately for birders, however, that swift flight also poses challenges to proper swallow identification, since these birds rarely remain still to offer easy, thorough viewing. By knowing what specific clues to look for, however, it is possible to accurately identify different swallow bird species. To properly identify swallows, swifts, and martins, the proper equipment is necessary. Binoculars: High-quality birding binoculars that offer a wide field of view are best for swallow identification. Lenses that resist or eliminate glare are also recommended so birders can follow the action of swallows in the air without being blinded by changing the lighting in bright skies. Strong binocular magnification can help bring these birds much closer to see the subtle details that distinguish similar species. Camera: A good quality camera with high-speed focus and a high shutter speed can help birder-photographers capture images of the swallows they see for later identification. A good zoom is also useful for photographing birds at a distance, particularly in nesting areas, without causing stress or otherwise disturbing any nervous birds. Field Guide: A field guide that shows swallows both perched and at different flight angles with varied wing positions will be most useful for swallow identification. Because these birds move so quickly, multiple flight shots can help birders make suitable visual comparisons to identify the birds they see. Hat: While a hat will not help outright with bird identification, a comfortable birding hat with a wide brim can help protect birders from the sun and glare while viewing swallows. This will allow for longer, more satisfying looks that can lead to proper identification. Color: Is the bird's plumage iridescent or dull? Are the underparts and upperparts different colors? How sharp is the contrast on different body parts? Head: Are any markings visible? Is the forehead, crown, cheeks, throat, or nape a different or distinct color? Breast: Is there a necklace or band that crosses the bird's breast? Is it a sharp marking or more fuzzy, smudged, or blurry? What color is it? Wings: How long are the bird's wings? Are they tapered or rounded? How broad are the wings compared to their length? What angle are the wings held in a smooth, straight glide? Tail: How long is the tail? Is it straight, notched, or forked? Does it have long streamers? Are any spots, streaks, or other markings visible? Rump: What color is the bird's rump? Are there patches of color on the sides of the rump? Is the rump visible in flight, when the bird is perched, or both? While swallows are relatively small and move quickly, it is often possible to successfully identify the swallow species just by noting a few field marks or other clues about its appearance. Along with field markings, other characteristics about swallows, swifts, and martins can be substantial clues to their identity. Range and Habitat: The location a bird is seen in is a great indicator of its species. Compare the season the bird is seen to its geographic location and note the habitat, such as open fields, woodlands, or lakesides, to better determine which species it is. Sounds: Many swallows sound similar and solitary birds can be hard to hear, but if a swallow colony is found the variety of sounds can be used to help with proper identification. Birders may want to consult swallow colony recordings to learn common calls and sounds. Nest Construction: Swallows build very distinctive nests and seeing that nest construction can be an instant confirmation of a particular species. 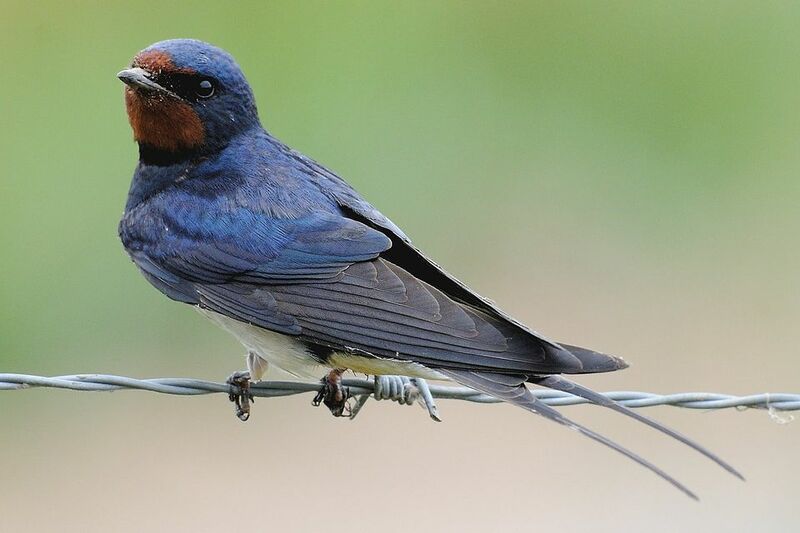 Check for cavity-nesting or open nesting birds, nesting materials, man-made nesting structures such as purple martin houses, and other clues for swallow identification. Flocks: While swallows can blend together in mixed flocks, large flocks of one species are most common. Instead of getting frustrated trying to identify a single bird, watch multiple birds for different identity clues that will either confirm a species or make an unusual guest stand out. Identifying swifts, swallows, and martins can be a challenge, but with practice, any birder can become familiar with their local species and easily learn to identify these birds properly.